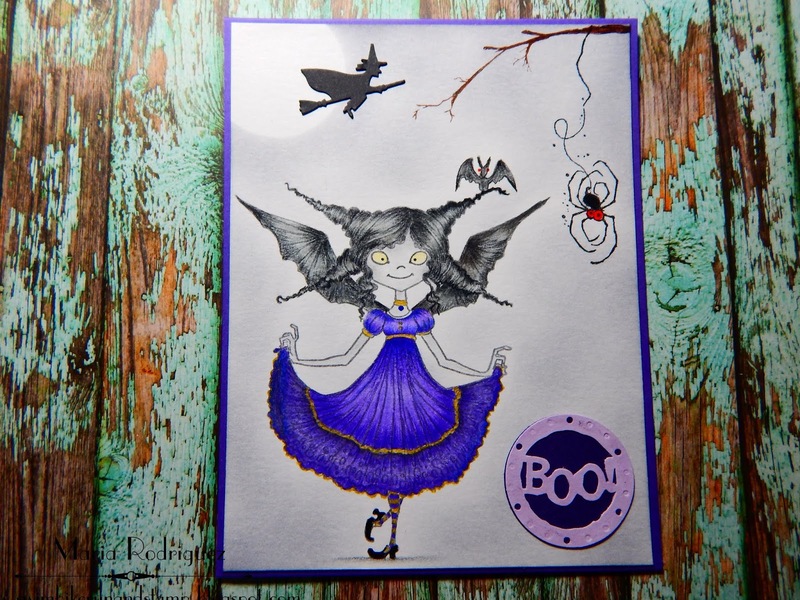 Hello dear blogging friends: Tomorrow is Halloween so here at SHOPPING OUR STASH, my teammates and I are showing off our Halloween cards and we hope you come and join the fun showing us yours in the gallery. Here is mine and I hope it inspires you to come and play along. This little Bat Girl (no, it's not Batman's sidekick, LOL!!) 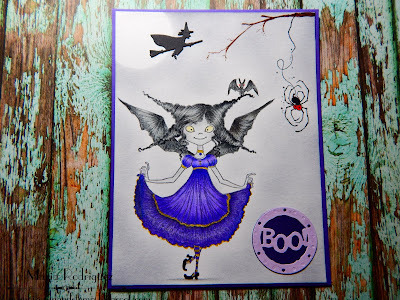 is from Kraftin' Kimmie and it's called "Batty Princess", (I've had this rubber stamp for at least 3 years), I absolutely love her wings, her hair, her dress, her batty friend and, of course, her spider friend too. I stamped her on a piece of watercolor paper with Gray Stazon ink and colored her with my Sakura Koi watercolors and my Prismacolor pencils. The spider is from a super old Stampin' Up! set called "Best Friends" that came out back in 2006, talk about OLD, eh? the BOO sentiment was punched with a punch that is so old also I had forgotten where I got it. 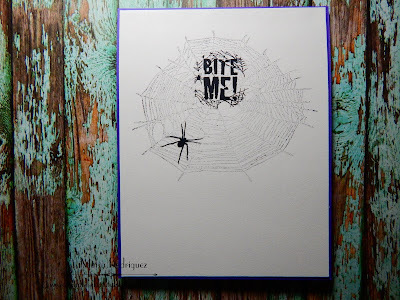 All of the images are from a retired SU set called "Bite Me"
So I hope you get your Halloween stamps out and come and join my teammates and me in the SHOPPING OUR STASH gallery, don't forget to stop by the DT's blogs to check out their creations and get more inspiration from them. Maria she is fabulous, if I did Halloween she would be on my list. Your colouring of her particularly her dress is amazing. She is simply put stunning as is your card. Well done my friend. So cute! I like the blue for a change instead of the traditional orange and black. Wonder if she does her own hair ??? Cute little witch way up in the sky ! This is adorable, love tha KK stamp, I have some really old ones of KK too. Kraftin'Kimmie lives about 1 1/2 hours drive from me. I need to get more of her stamps. Frugal Friday she puts some on sale for the weekend. Anyway awesome card. She is the essence of Halloween "lovely!" So sweet - and FUNNY! Love this festive card, Maria. Spooky fun! Ooooh, that hair! Maria, your coloring is fantastic! Gosh, I love the spider, too! What a couple of characters! That wee batgirl is adorable! WOW love how you've finished the inside of your card as well!